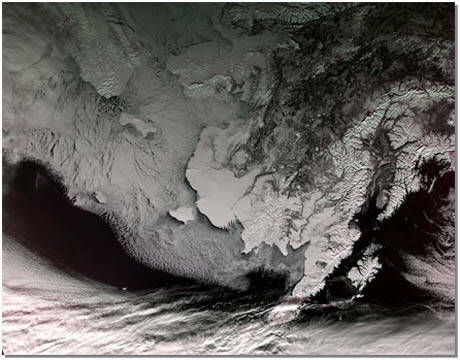 A view of Alaska, northwestern Canada and the Bering Strait. 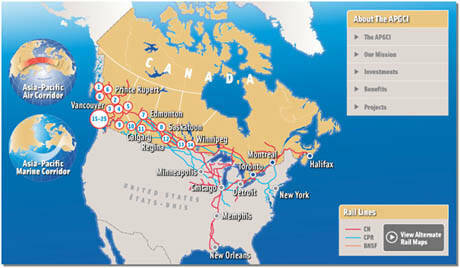 A map of Canada's existing rail corridors connecting to the U.S. rail corridor along the Mississippi River. 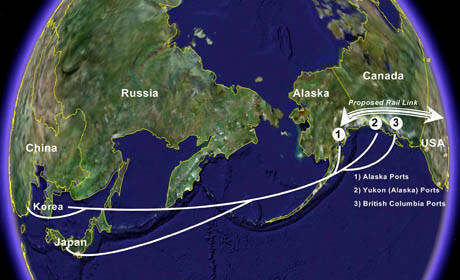 The vision of an Alaska Canada Rail Link connecting to U.S. and Canadian ports for ocean-going shipment to Korea, Japan, and China. 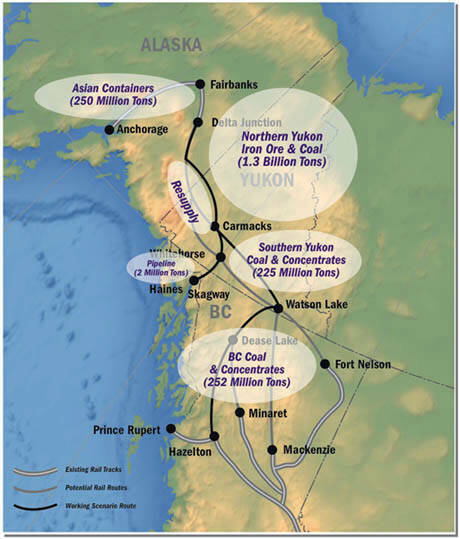 A map of 50-year life-cycle sourcing for route options connecting the Alaska Railroad to the Canadian National Railway in northern British Columbia. 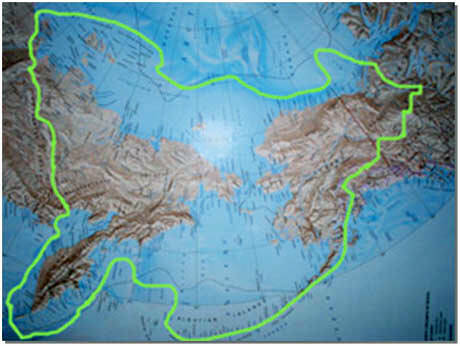 The green outline indicates the area that was exposed during the last Ice Age, the area now known as Beringia or the Bering Land Bridge. British Columbia coal and Yukon iron ore would account for more than three quarters of a total 50 million tons per year potential volume in an ACRL. 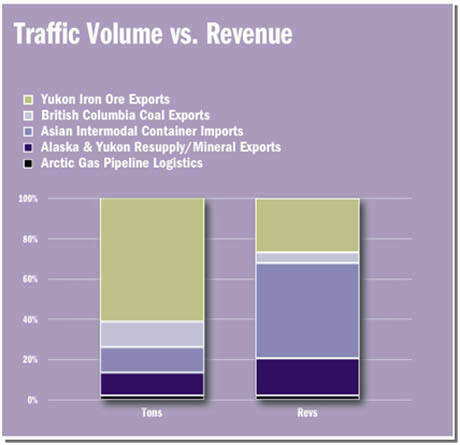 Less than one quarter of the total volume is the balance of Alaska, Yukon and Asian traffic. Each dignitary swung at the Golden Spike with wild abandon until he hit it square on the head, then handed the maul to another. The date was May 10th, 1869, and the location was in the middle of nowhere - a barren spot called Promontory Point, Utah. Yet driving the last spike in the first railroad line to span the continent of North America was an act of epic symbolism marking the beginning of the massive settlement of western North America and ushering in an economic boom in the United States that continues to this day. Sixteen years later a similar transcontinental railway line was completed across Canada, and that nation's fortunes immediately and permanently improved. Indeed, history has demonstrated over the past century-and-a-half that building railways is an essential task in developing efficient and productive national economies. Railway development across the globe, however, has been anything but universal. Only North America and Europe have integrated rail systems connecting all the countries on their respective continents, and only the North American system is built to a single gauge, or width between the rails (4 feet 8.5 inches), commonly known as Standard Gauge. The gauges of rail lines in Russia and the former Soviet states of Eastern Europe, as well as Spain, Portugal and Ireland, are wider than the Standard Gauge railways serving most of Western Europe. In Asia, Africa and South America, no coherent interconnected rail system has yet been developed, and each continent has railways built to three or more different gauges. Historically, integrating the railway systems on these three continents has faced impediments posed not only by gauge disparities, but also by political differences and geographical barriers. As a consequence, huge land areas of the world have no significant railway infrastructure. It is no coincidence that there is a high correlation between regions of the world suffering from depressed economic development and those lacking railway services and interconnections. Whether we like it not, modern technology has decreed that the world will be brought together. With digital electronic technology facilitating communication and the spread of ideas, and with air transport expediting the movement of people, the joint effect is to foster the appearance of a world becoming smaller. Yet at the same time, the gaping disparities in economic development are worsening in many parts of the world. The international trade essential to balancing development in the world remains largely bound to the earth's surface in the form of ships, railways and trucks. For long-haul transport of heavy goods, railroads are safer and much more efficient and environmentally friendly than trucks, making rail the clearly preferred transport mode for serving the vast continental interiors far from the oceans. Closing the gaps between the world's existing rail systems, therefore, is a critically important task in the effort to expand and balance desperately needed economic development to provide for the world's ever-growing population. Connecting the globe's developed rail networks is one of the surest methods of enhancing trade opportunities, opening access to resources that otherwise could not be developed, encouraging international travel, creating new jobs, and promoting mutual understanding and cooperation. And in this time of critical concern about drastically altering Man's role in Earth's rapidly changing climate, electrified railway system expansion and interconnection offers by far the most effective means of providing for ever-expanding international trade volumes without creating added environmental burdens. A glance at today's global rail map shows clearly that the widest and most significant missing link is between North America and Asia, the world's richest consuming market on the one hand, and its largest, most resource-rich and most populous land mass on the other. Geologists tell us that during the most recent Ice Age, when ocean levels dropped with the accumulation of ice on the land, these two huge continents were connected by a now-submerged mountain range. Experts in anthropology have determined that 12-15,000 years ago, the humans who first populated North America migrated from Asia across that narrow isthmus. Today the continents are separated by the seasonally ice-covered Bering Strait which is a mere 44 miles (72 km) wide. By using readily-available 21st Century technology, it is possible in principle to travel between the continents much faster, more safely and far more comfortably than those hardy pioneers who journeyed from one continent to another. Tunneling beneath the Bering Strait to connect the world's two largest land masses is technically feasible and can be done quite safely. Doing so would open the way for constructing the most important overland trade route in the world. 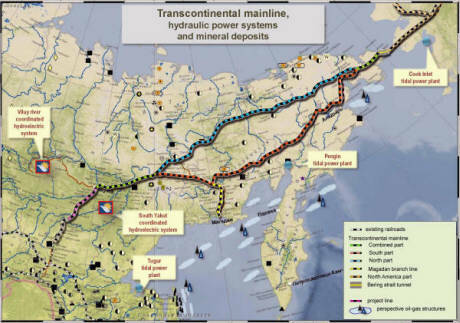 Constructing a system of tunnels and a continuous rail line connecting the rail networks of Asia and North America would open the way for much-needed resource development activities capable of generating millions of new, well-paying jobs to support the living standards of a world population expected to increase to more than nine billions from the current 6.5 billions well before the end of this century. The idea of connecting Asia and North America is hardly a new one. 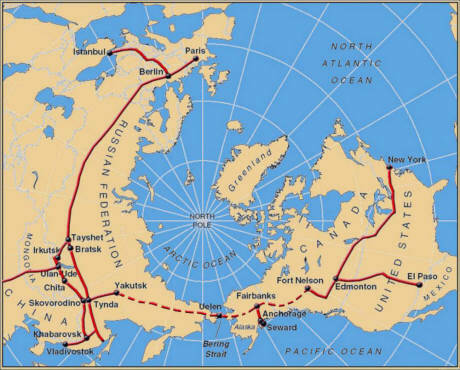 It was discussed in Russia in the late 19th Century when the Trans-Siberian Railway was being built, and was the subject of a serious attempt in the United States more than 100 years ago. At that time, a private corporation called the Trans-Alaska-Siberian Railway Company was incorporated in New Jersey for the purpose of building a tunnel and connecting railway lines between the Trans-Siberian and the North American railway network. Even then railroad tunneling technology was advanced enough to make the concept practical from an engineering standpoint, thanks to completion of several long rail tunnels through the Alps in Southern Europe. Funds totaling six million dollars were raised privately, and feasibility studies were conducted in 1905. 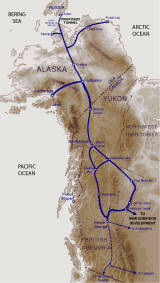 These concluded that a Bering Strait railway and tunnel project could be completed for approximately $300,000,000. An editorial in the New York Times of October 24th, 1905, observed that "the Bering Strait Tunnel is a project which at some time in the future is likely to command a great deal of very purposeful consideration." The project did not proceed at that time, however, largely because the political situation did not foster the kind of total cooperation among the affected countries that would have been essential for the success of such a massive international infrastructure project. Throughout the 74-year Soviet period of Russian history, the bitter ideological struggle between the Soviet Union and the U. S. blocked any realistic thought of a direct rail link connecting the two countries. With the USSR's demise in 1991 and the subsequent thaw in relations between Russia and the U. S., major impediments to renewed economic and political cooperation between the world's biggest and most resource-rich nation and its largest and most productive economy have largely disappeared. Russia and the United States have far more reasons to work in harmony today than they have had at any time since the U.S. acquired Alaska from Russia in 1867. Russia quite logically needs to develop its almost limitless natural resource trove in the Russian Far East and Siberia, and the U.S. can be a ready market for many of those resources. In addition, the stimulus of building the Bering Strait rail link could serve as a major spur to expanding rail links to the south of Siberia, a development that would make Russia's massive untapped resources accessible to the rapidly growing economies of China, Korea and Southeast Asia. North America, the world's largest consumer of energy and many other natural resources, needs new, more reliable and less expensive sources of supply to maintain its high rates of productivity and consumption. Siberia contains major developable deposits of virtually every known valuable mineral and energy resource, including an estimated 70 percent of Russia's hydro-electric power generation potential, as well as crude oil and natural gas deposits that dwarf the proven reserves of the Middle East. These Russian assets are located much closer to China, Japan, Korea and even the United States, than are the major current energy suppliers in the Middle East. This fact alone could provide more than ample justification for the Bering Strait tunnel and railway project. 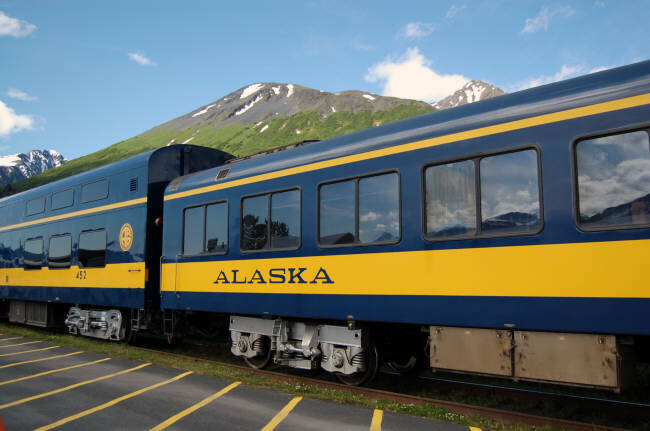 Furthermore, Alaska possesses its own treasure chest of undeveloped and presently inaccessible resources along or near the route of the proposed railway construction. The Northwest Territories and the Yukon in Canada also possess large mineral and hydrocarbon deposits, as well as valuable timber and water resources. Northwestern Alaska harbors the single largest high-quality coal deposit in the world, an almost unfathomable four trillion tons, containing the energy equivalent of 22,000 years of current North Slope oil production at the rate of 1.5 million barrels per day! Alaska, via the rail line, could also provide an enormous supply of fresh water for the already water-starved cities of the American Southwest such as Las Vegas, Phoenix and Los Angeles. In addition, the 49th State contains copper, iron ore, lead, nickel, zinc, molybdenum, magnesium and other metallic and non-metallic ores and rare earth elements which may never be developed without railway access to processing and consumption centers on both continents. But why, one might ask, is a land transportation crossing of the Bering Strait needed to develop all of these resources? Couldn't local infrastructure on each continent be built to access these valuable assets without connecting the two continents? And besides, isn't the Bering Strait one of the most remote and inhospitable places on the planet? These are valid and reasonable questions that would occur to most people who have grown up looking at the common Mercator projection wall map of the world, where a straight line drawn between Chicago and Beijing passes just north of San Francisco. In reality, of course, the world is not flat and two-dimensional like the wall map; it is a three-dimensional ball on which the shortest-distance line between Chicago and Beijing actually passes just north of the Bering Strait, illustrating the so-called "great circle" effect. For this reason, non-stop flights from O'Hare to Tokyo, Seoul and Beijing all pass over the Bering Strait, while flights from New York to the same destinations usually cross even farther north. The location of the Bering Strait is not remote at all when cast in this light, and it would be hard to imagine a spot more suitable for a connection to minimize the overland transport distance between major markets on each continent. It is true, however, that the Bering Sea is climatically inhospitable virtually year-round, but this problem can be neatly avoided by crossing beneath its narrowest stretch via the planned system tunnels whose constant ambient temperature would be about 6 degrees Celsius, a safe and comfortable environment for tunneling crews. When measured against current shipping patterns, the advantages of the Bering Strait's keystone location, at the top of the "great circle" arc between Earth's two major land masses, is even more evident. The distance from Beijing to Chicago for the movement of Chinese manufactured goods is now more than 9,000 miles via rail transport on both continents and the shortest ocean-shipping lane. Depending on the U.S. port-of-entry, that distance can be significantly greater. The same goods would have to travel only about 7,500 miles by rail once the Bering Strait connection is completed into China. Given the shorter distance, greater speed of railways in comparison with ocean shipping, and elimination of two steps of transloading from truck or train to ship at a Chinese port and off-loading from ship to surface mode at a U.S. port, the Bering Strait rail route will offer inland shippers on both continents new and more competitive shipping alternatives. Shippers should gain a number of cost advantages, including lower inventory-in-transit expenses, less loss from product degradation, damage, shrinkage and pilferage by elimination of port handling and modal transfers at both ends of the ocean movement, simplification of shipping documentation and customs inspections, and fewer delays due to weather, port congestion, work stoppages or other unforeseen events. Mr. Koumal had extensive mining and tunneling experience on four continents, and his correspondence outlined the ways in which a tunnel and railway link from North America to Asia could provide a permanent solution to Alaska's future economic health concerns. It would not only provide, he wrote, the impetus for development of the State's non-petroleum resources, which could not be accessed by the North Slope pipeline, but it would make Alaska the critical link in what could very likely become the busiest trade route in the world. 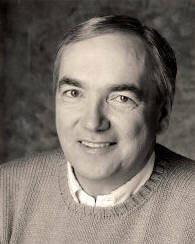 Taking a next step on the long road to the Bering Strait transit link, Mr. Koumal, along with other visionary citizens in Alaska, the Lower 48 States, Canada and Russia, then founded the Interhemispheric Bering Strait Tunnel and Railroad Group (IBSTRG), an Alaska not-for-profit corporation. Their charter prescribed that they were to study, promote and educate the public about the desirability of creating a land connection between North America and Asia. IBSTRG has conducted multi-day seminars in Moscow, Fairbanks and Washington, DC, as well as participated in Bering Strait discussions at international peace and economic development conferences in Anchorage, New York City, Moscow and Seoul. Strong supporters of the Bering Strait tunnel project include Alaska's two-time former Governor and U. S. Secretary of the Interior Walter Hickel, now an influential Anchorage businessman [Walter Hickel died May 7th, 2010 in Anchorage, Alaska. - InterBering] . Several Alaskans serve on the IBSTRG Board of Directors, including Joseph Henri, a highly-respected Anchorage attorney who has been active in Alaska political affairs for almost 50 years, and Jim Stimpfel of Nome, who is deeply involved in local native economic development activities. These far-sighted Alaskans see the Bering Strait link as a key to future world peace, prosperity and security, a vision shared by forward-thinkers around the world who understand the need for cooperative and widespread wealth-creating infrastructure projects to help eliminate global poverty. Governor Hickel has spoken in support of the Project in several public forums, using his now-famous mantra "Why war, why not big projects?" After a symposium in Moscow in April of 2007 at which Governor Hickel endorsed the Project, the Russian Government authorized IBSTRG to proceed with coordinating the international feasibility studies to move the trans-Bering Strait tunnel and railway-building efforts forward. Preliminary investigations of the engineering feasibility and estimated costs of constructing a Bering Strait tunnel crossing have been very encouraging. The concept of building a tunnel system under the Strait has obvious advantages over alternative but entirely unproven designs to build a huge bridge structure above the surface. Speculative engineering plans for a massive Bering Strait bridge project were the subject several years ago of an hour-long television program on the Discovery Channel. The program presented a bridge design based on automobile and truck usage as well as rail transit. Knowledgeable civil engineers, however, reject the whole proposition as being patently impractical and far too dangerous and costly to build and maintain, both in monetary terms and in probable loss of human life due to the Arctic climate. In addition, such a crossing would be far more environmentally unfriendly than a tunnel system. Building a paved highway across the permafrost and tundra paralleling the rail system between railheads on the two continents would have much more significant impact on the sensitive environment of the far north than laying steel rails on a bed of chipped granite ballast. Even if it made sense economically and environmentally to build a highway bridge at the Strait, the bridge would not be usable for more than half the year. Maintaining such a bridge and its associated highway network would create substantial added costs for public services, such as safety, emergency aid, fuel supply, maintenance facilities and added customs inspections, which would be unneeded with the controlled and limited access characteristics of railways. Rail lines can be built at a lower cost per mile than can highways, with far less environmental impact and infringement, and with greater year-round carrying capacity and a substantially lower expenditure of energy. The proposed rail line can be expected to routinely handle four 10,000-ton freight trains per hour in each direction, while the same tonnage would require a minimum of 1,000 trucks per hour, or a truck passing by every 3.6 seconds! Fuel consumption for these trucks at an average of 50 miles per hour and 5 miles per gallon would be about 10,000 gallons per hour. This would be more than 5 times the energy consumption of the equivalent diesel-powered trains and at least 15 times that of the non-hydrocarbon-fueled electrified trains of the planned the Bering Strait rail line, which would utilize several alternative "green" sources of electricity such as geothermal, wind, solar, nuclear and both riverine and tidal hydropower. Car-ferry trains, such as those now operating in Europe through the English Channel Tunnel and several of the trans-Alpine tunnels, can readily allow automobile users to enjoy the safety and comfort of the train while their vehicles are transited between the Asian and North American highway systems without creating the enormous energy waste, environmental intrusion and public safety problems inherent in operating a sub-Arctic highway link. 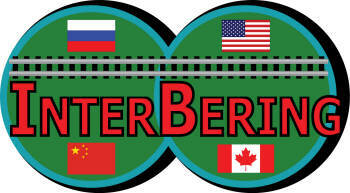 The IBSTRG organization has already completed estimates of the costs for constructing the 4,800-mile rail connection between Yakutsk, Russia's closest existing railhead to the Bering Strait, and Fort Nelson, British Columbia, the northwesterly spot on North America's railway map. They project a cost of approximately $15 billion for the construction of a single-track electrified railway line with passing sidings averaging 15 miles apart. Extending the line southeastward into the Edmonton, Alberta, terminal area, where competitive connections can be made with Canada's two trunkline rail carriers, would be a more sensible initial eastern terminus for both operating and economic reasons, and this additional 500 or so miles of construction would cost approximately $1.6 billions. Costs for the initial phase of tunnel construction are projected to be $12 billions, based on an estimated average of $19,800-per-linear-foot for tunnel boring. 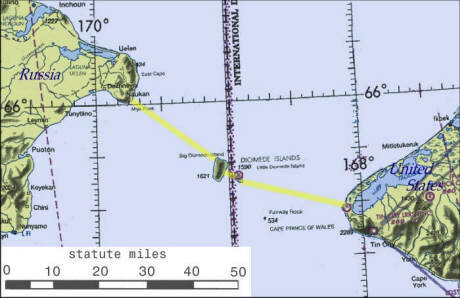 Plans for this phase of the Bering Strait crossing take advantage of the fact that two islands, Little Diomede Island on the U. S. side of the International Dateline and Big Diomede Island on the Russian side, lie in the middle of the strait barely two miles apart. These islands provide convenient intermediate sites at which tunnel access will be possible for ventilation, supply, muck removal, drainage, boring faces and emergency escape exits. Initial tunnel construction planned for carrying rail traffic between the continents is envisioned as two 10-meter diameter single-track railway tubes. Between the two islands, plans call for multiple railway tubes in addition to the other two bores. This would allow trains to meet or pass in the middle of the tunnel system before the second rail bore is completed, and would allow the rail line to begin generating substantial revenues well before the second rail tunnel is fully operational. Preliminary assessments of the Bering Strait-area geology indicate that the rock formation through which the tunnels would be bored consists primarily of a solid granite massif with no tectonic fault lines or volcanic activity within 900 miles. If these characteristics can be confirmed by the detailed geologic studies required in advance of final engineering design for the tunnels, then it may be possible to complete the first stage of tunnel construction within three years of excavation commencement. 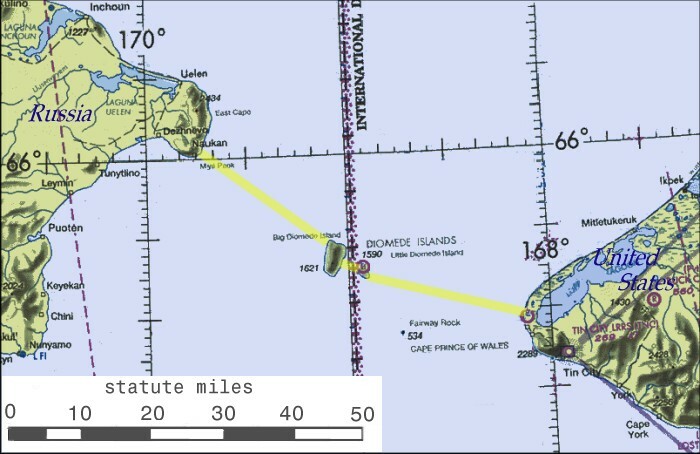 This estimate assumes that four shielded TBM's (tunnel boring machines) will be utilized simultaneously on each tunnel, with two working outward from each continent and two working shoreward in each direction from the islands in the middle of the strait, and that the TBM's will average a daily progress rate of 25 meters per machine. The granite chips removed by the TBM's should be an asset rather than a waste-disposal problem, unlike most tunneling projects, since granite is the preferred ballast material for construction of new rail lines. As traffic on the new trade route increases and added capacity is required, the third tunnel bore to provide two-way double-track transit across the full length of the Strait could be completed at a cost of approximately $9.9 billions. Adding additional mainline tracks across the full 4,800 miles of the rail route would cost on the order of $15 billions for each added track. Constructing a double-track standard-gauge line down the east coast of Russia south into China to shorten the distance to Beijing, Tokyo and the Korean Peninsula could be expected to cost an additional $12 billions. In all cases it is assumed that the lines will be built to Standard Gauge, with the ultimate goal of tying together the world's rail network, most of which is already laid to that gauge. It is also expected that the well-tested technology of variable-gauge bogies (wheel assemblies) will be used to interchange traffic with the Russian-gauge system, in order to avoid long delays at the newly-created gauge-change interfaces inside Russia. Where necessary to meet Russian requirements, dual-gauge tracks can be constructed that will accommodate both Standard and Russian gauge trains. These preliminary estimates indicate that at least $65.5 billions will have been spent on construction by the time the completed third phase extends a double-track standard gauge line into China. In addition to rail and tunnel building costs, equipping the railway with 1,000 locomotives, 120 multiple-unit passenger trainsets, and 50,000 pieces of freight rolling stock over ten years will add another $11.8 billions to the project price tag, and an additional $9.5 billion will be needed for yards, maintenance shops, servicing facilities, power generating plants & substations, passenger stations, container terminals and materials warehouses. These added capital costs bring the project total to approximately $87 billions to create a functioning heavy-duty, high-capacity rail route from China to competitive mainline interchanges with North America's rail system. The primary freight traffic flows expected from completion of the Bering Strait Tunnel Project will come from two sources. Located all along the route of the proposed new railway are currently inaccessible natural resources that cannot be economically retrieved, processed and marketed. The Russian development agencies that have studied the potential effects of the trans-Bering rail link have estimated that more than 120 million gross tons of freight annually can be generated by originations and terminations at newly-developed sites in Siberia alone. In addition, once the new rail line reaches an interchange with the Chinese rail system, it is expected that at least 3,000,000 forty-foot containers per year would move across the new tunnel route as the Chinese economy continues to grow and ports become more and more congested and expensive to expand. Significant additional traffic would be generated by new resource and economic development in Alaska and Northwestern Canada along the rail route, where valuable untapped natural resources abound. Freight traffic is hardly the only justification for the Project, however. Passenger traffic will also be a viable component of the economic value of the new railway route. Not only will trains be able to provide cheaper, safer and higher volume passenger transport between Asia and North America, they can do so with less environmental damage than alternative modes. In addition, the rail line will pass through some of the most awe-inspiring and hard-to-reach scenic regions on the planet, and will do so without bringing with it the kind of undisciplined development that so often accompanies highway extensions. There will be significant social benefits gained with the construction of the new railway as well. Access to readily available, affordable electric service will be a major improvement all along the rail route. New towns, hospitals, schools and other community services will have to be developed in areas where little exists today, and high-value jobs will be created by the thousands in areas where subsistence has long been the primary means of human survival. Indigenous peoples all along the rail line will have easy and economical access to the outside world, to local healthcare, to good jobs and to modern comforts taken for granted in the developed world, and all without having to grant intrusions from the outside world which might disturb their historic cultures. The benefits to international relations between countries on the two continents should also be substantial. When nations have close trading relationships, they rarely become antagonists, and the Bering Strait rail link promises to bring the U. S., Russia, China and Canada closer together in the future than they have ever been in the past. It is not difficult to imagine adding Japan, Korea, Mongolia, Southeast Asia, India, the Middle East and Mexico into the sphere of influence of "The Pacific Rim Railway" as well. Even Europe, Africa and South America could ultimately be connected into a new worldwide railway system. Creating more trade, more jobs, and more real wealth will be the major benefits to the world of the Bering Strait rail link, and in the process there will be fewer reasons to consider armed conflict as a solution to real or perceived international injustices. The big question in any multi-nation infrastructure project of this scope is "How will it be funded?" Funding at the level of $87 billions over a period of ten years represents less than 2 percent per year of the U.S. National Defense Budget, and investing in the Bering Strait Tunnel Project might well be the best-spent taxpayer money in history. Despite this logic, however, it is difficult to imagine that such funds would be directly appropriated by Congress, especially in the current economic climate. Nonetheless, it is quite realistic to imagine that the governments whose land and natural resource assets will be made far more valuable by the Bering Strait crossing might be willing to participate in its funding without investing taxpayer cash or taking significant risks. The governments of both the U.S. and Canada encouraged the opening of their western lands by offering gifts of right-of-way and substantial adjacent land parcels to the builders of new railway lines once they had been constructed. These gifts were known as "Land Grants" and they were not only instrumental in the settlement and industrialization of much of North America, they returned to the grantors many times the value of the granted lands in the form of new jobs and tax revenues, higher values for the remaining public property and access to critical resources. When presented in this light, it seems the three countries most directly benefited by the Bering Strait railway connection construction might be willing to participate in a modified land grant financing plan in order to help attract private capital to fund the project. Governments own as public lands the vast majority of the territory through which the rail lines would be built. Rather than gifting property outright to the new railroad, the governments could choose to accept long-term, low-interest bonds or a combination of securities reflecting the current value of the property. Through such a procedure, all parties could benefit: the railroad company would gain assets that it could use as security for raising funds that would then be used to make those assets far more valuable. The governments would benefit in the same ways the 19th Century land grant donors did. They would also be earning interest on their investment in the railroad's bonds. Several other sources of funding are possible as well. One lies in the hands of the private company that builds and operates the Bering Strait rail line. Once the railway is completed and outfitted it would provide local service, both passenger and freight, on the newly-constructed route. 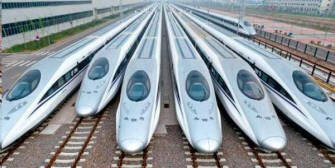 To raise some of the construction funds, the new company could offer existing North American and Asian railway companies the opportunity to purchase operating rights for a specified number of trains per day to cross the new rail route between continents. This would allow open access and full competition among the operators on both continents for the international trade, which is expected to grow rapidly once the line is operational. Each carrier would pay an initial charge to reserve its desired number of slots on the daily dispatch sheet, and then would pay an additional charge to the Bering Strait operating company for moving its trains across the new intercontinental link. In this way funds could be raised in advance of operational completion, and all competitors would be treated equally with regard to costs of access to the newly-opened markets. Additional funds can be raised by operating excursion trains during the construction period to allow thousands of the curious and adventurous to view the progress of the world's largest, and possibly most important, international infrastructure project. Other sources of revenue will be available during the rail construction phase as well. Mines and processors will be able to develop along the railway even before it is completed, and these customers' use of the rail facilities can generate substantial cash flow. Completion of the line from British Columbia to central Alaska to connect the Alaska Railroad directly into the North American system for the first time should result in the availability of some existing traffic currently moving by barge from Seattle, in addition to creating new markets for existing customers to increase their present traffic flows. 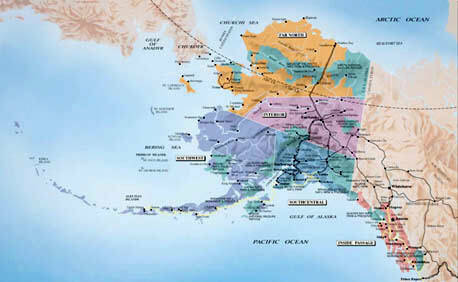 The connection to Alaska would also permit the Port of Anchorage to become a participant in the Asian-North American container trade, substantially shortening the current ocean shipping distance. This could both ease current West Coast port congestion and cut transit times by getting containers onto the rails faster. The rail right-of-way can also be utilized to generate other income before the rail route is completed. Oil, gas and water pipelines and communication and power transmission cables can be laid alongside the railroad track structure. These ancillary facilities could generate substantial income for furthering the railway construction. The right-of-way could also host microwave, mobile communications and broadcast transmission towers as a source of rental income. All told, these sources could provide a substantial flow of cash to aid in completion of the overall project. Once an intercontinental rail link connects the vast and rapidly growing Chinese economy directly with those of North America, the enormous economic benefits on both sides of the Bering Strait should rapidly increase traffic volumes well past the break-even point for a commercial venture. The new railway will be capable of handling 48,000 container TEU's (twenty-foot equivalent units) per day in each direction at normal capacity. If average revenue per TEU is a conservative $2,000 and 80% of total TEU's are revenue loads (100% eastward, 60% westward), container traffic alone can generate $153,600,000 per day, resulting in roughly $53.8B per annum. At a normal operating ratio of 75%, container traffic alone could generate over $13.5B for interest and debt payments, easily sufficient to justify an overall investment of more than $100 billions. Over the ensuing years, many other traffic sources will develop along the new rail route, and many connecting lines will be built to tap new resources to create real wealth for the sustenance of a growing world population and substantial additional traffic for the railway. The commercial value of building the Bering Strait Tunnel connection as the keystone link in an integrated worldwide railway network should prove itself very rapidly after its opening. 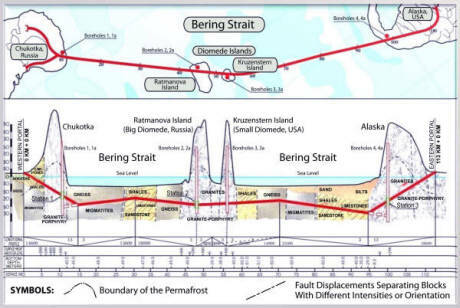 Initial steps toward realization of the Bering Strait connection will involve a multitude of issues raised by such a massive project. These include preliminary studies assessing the economic justifications, environmental impacts, and sociological and geopolitical implications of the project. Additional aspects include elaborating on the funding options; detailing route plans, engineering designs, and plans for logistical preparations and materials supply sources; and completing studies providing detailed seismic, geologic and hydrologic characteristics of the proposed rail and tunnel alignments. Another major task will be the drafting of an appropriate international compact among the participating nations. This compact would codify the desired agreements relative to franchise rights, eminent domain, property investments, labor laws, taxation, environmental considerations, construction permits, security, customs practices and many other aspects of such a complex undertaking. Current projections indicate these preparatory steps can be completed within three years at a cost of about $60 millions, with the help of a number of research universities that have already expressed an interest in participating in the necessary studies. The political leaders of three great nations will also have to agree to cooperate to make the dream of connecting two vast continents a reality. If the results of these initial determinations and negotiations are as positive as anticipated, the overall project could then commence its initial construction phase and proceed rapidly toward full commercialization. Given sufficient funding over the next three years, it is conceivable that another "Golden Spike" ceremony, this time using modern gold-plated rail fasteners, commemorating the joining of Asia and America might occur as early as 2019 [this date is not possible - InterBering] , somewhere in the middle of the Bering Strait about 250 feet below the surface. The original Golden Spike and the transcontinental rail line it completed represented one nation becoming united at a deeper level. Similarly, the act of installing the final fastener in the intercontinental, trans-Bering Strait rail line would make a powerful statement about hopes for increasing real wealth, harmony and eco-friendly economic development throughout the world. The day the first train crosses the International Date Line between Asia and North America will certainly become one of the most memorable dates in world history. It is time to establish a modern, high-capacity electrified railroad across the vast northlands of Alaska and Siberia, connected via tunnels beneath the Bering Strait, thus closing the missing link in an emerging global railway network that is the key to expanding and equalizing economic development around the world. 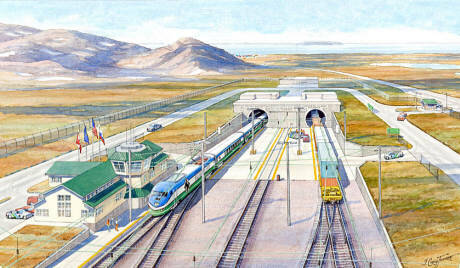 Artist's conceptual view of the proposed Bering Strait Railway Tunnel between Wales, Alaska, USA and Uelen, Chukotka, Russia. Copyright 2002 J. Craig Thorpe.